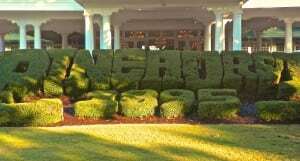 It feels special to enter the hallowed grounds of Pinehurst – the “American Home of Golf.” The elegant two-story Resort Clubhouse is a mini museum passing through to the 18th green of the US Open’s No. 2 where a stroll along the Walk of Fame transcends even St. Andrews. This is our golf history –old, new and continuously generating memories. 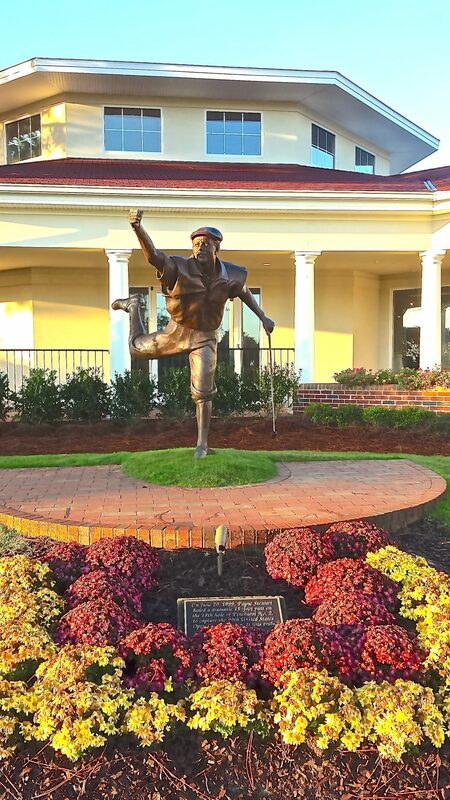 The most significant of statues is Payne Stewart’s fist pumping pose after his winning putt. Golfers may pose with him or anywhere else for fun photos on nine pristine green courses designed by the greats. 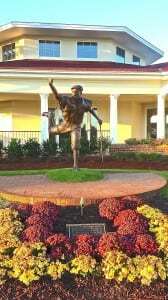 But the real Pinehurst experience stretches beyond the immediate Resort and Village as the Sandhills of North Carolina are smattered with great golf architecture, accommodations, cuisine and adventures. Just a couple miles away, is the Mid South Golf Club, designed by Arnold Palmer. The adjacent Mid South Club Lodge provides an intimate upscale stay in multiple condos. Open the door to a comfy living room appointed with leather couches, and full dining room next to the balcony overlooking the course, with private laundry, Jacuzzi tub, big comfy bed, fireplace, granite everything kitchen, and you will say, “Honey we’re home!” If for sale, we might have moved in to stay. 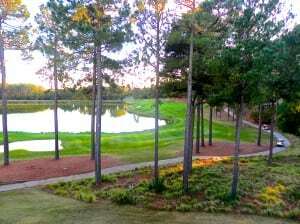 Bring your drinks and apps outside to the lounge chairs and watch golfers maneuver the lake and bunkers coming into 18. Plan your own strategy for the morning round. Thomas the starter is a welcoming character. He married an “English Rose” while working in the golf industry in Wales. He warns, “The #2 pond is a magnet so aim far left,” but he failed to mention that the forest could be the same for long errant hitters. 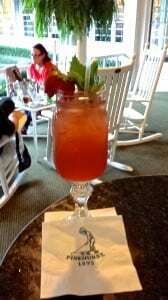 This was our first course in the Greater Pinehurst area and one worthy of repeat play. 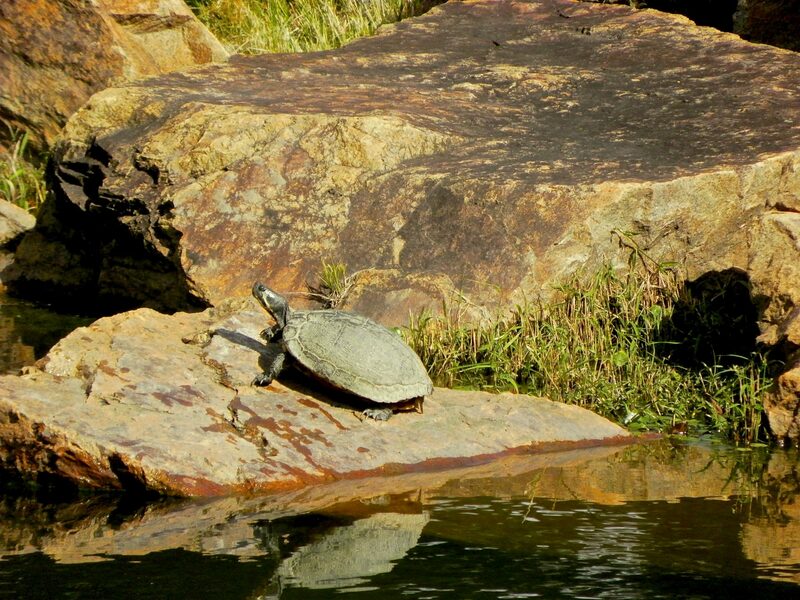 Tall pines and sandy spots in the hilly terrain identify the Carolina Sandhills. Also indicative of the region are advantageous forward tees. 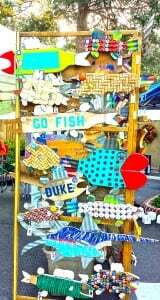 Ladies, nothing could be finer than teeing up in Carolina. Mid South Club has nice elevation challenges up and down. Number five’s downhill drive must carry a marshy waterway that continues en route to six with turtles congregating on a circular island. Numbers 9 and 18 are as much fun for the gallery as the golfers, viewed from the Plantation Grill in the clubhouse or the rented lodges. Sometimes the best strategy works and sometimes it doesn’t pan out. Either way provides amusement for the balcony galleries. 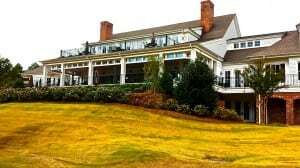 It doesn’t get any better than Mid South Golf and Lodging, whether it be a couple, buddies or family trip. Pinehurst Magazine ranked the Mid South course the #1 private course in the area and is second overall only to Pinehurst No. 2. Play is arranged for guests. The course layout and pro tips for Mid South are shared with those of the Talamore Resort Course in the Talamore Golf Resort Yardage Guide. Another mere mile close, this Rees Jones design is a fabulous run with a first and lasting impression on numbers 1 and 18. 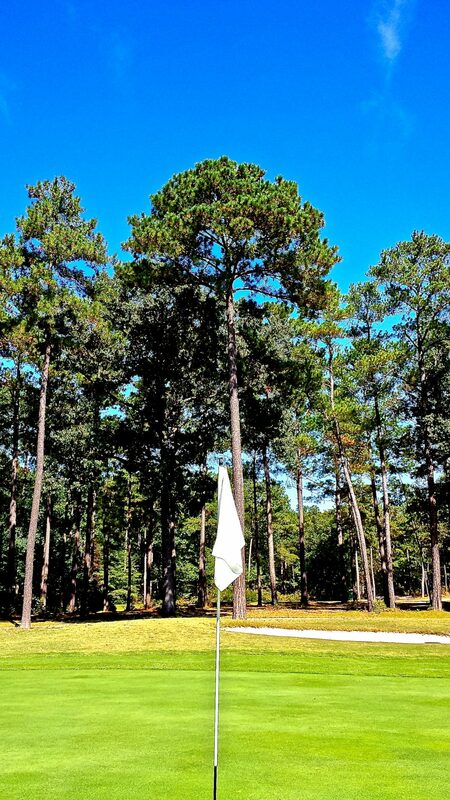 The tall pines purify the air as their pine straw blankets the sidelines like a red headed carpet. Number two has a fairway-bunkering complex that resembles a Picasso painting. 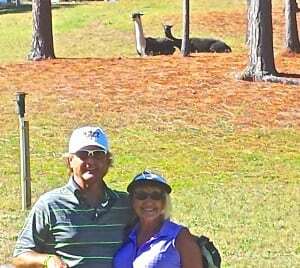 Complete thirteen and enjoy the famous treat of llama land in the fenced pasture down beside the 14-tee box. 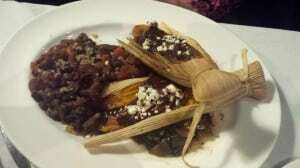 Why llamas? Golf pro Tag Leon explained how the owner was impressed with Chi Chi Rodriguez’ use of a donkey as a caddy and thought it would be a unique idea. His friend suggested that llamas make better pack animals and so it was that Dollie Llama and friends came to Talamore, following in the hoof steps of their Andes ancestors but now climbing the Sandhills, aiding and perhaps abetting golfers. Their attraction however was a double-edged sword as golfers spent more time trying to make good photos than golf shots and the pace of play became unacceptable. Now they have retired to a lazy llama role of chewing their cuds while golfers tarry briefly for selfies. 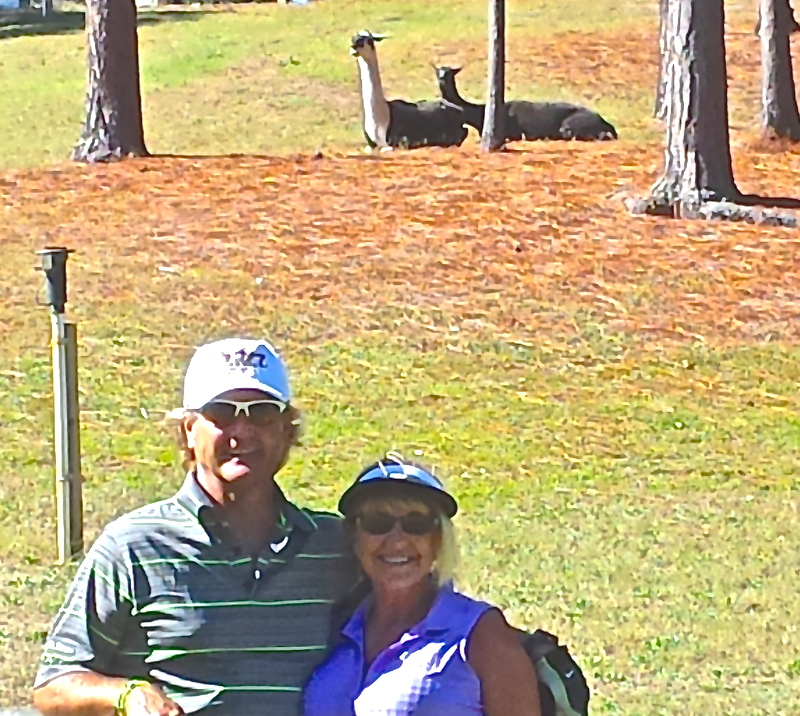 Dollie Llama provides one tip for hole 18 – “Good luck.” You will need it. With or without the llamas, this is a great tract. For a preview, check out the flyover at www.talamoregolfresort.com. Both courses are located in Southern Pines where singers welcomed northerners arriving to the train station in the 1800’s. Blocks of boutique shops, and restaurants now surround the downtown with a funkier vibe than the Village of Pinehurst and only five to ten minutes away. Plan to stroll the sidewalks in each area. 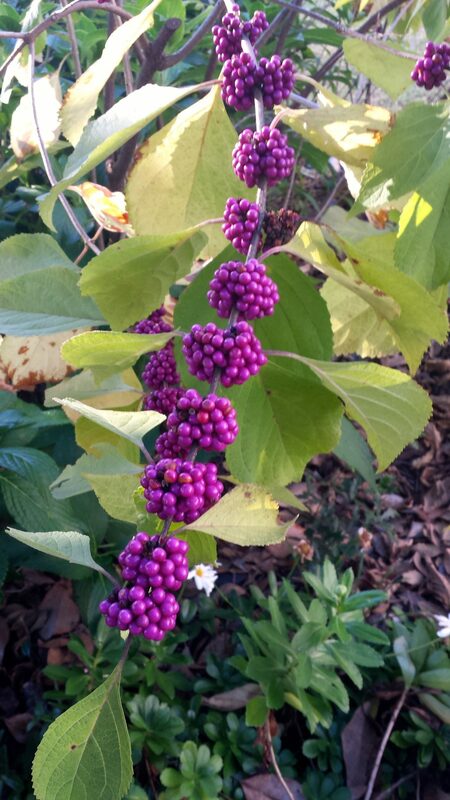 Pinehurst Village was the brainchild of James Walker Tufts from Boston who believed the Long Leaf Pines held healing powers. He hired Olmsted to design the village. 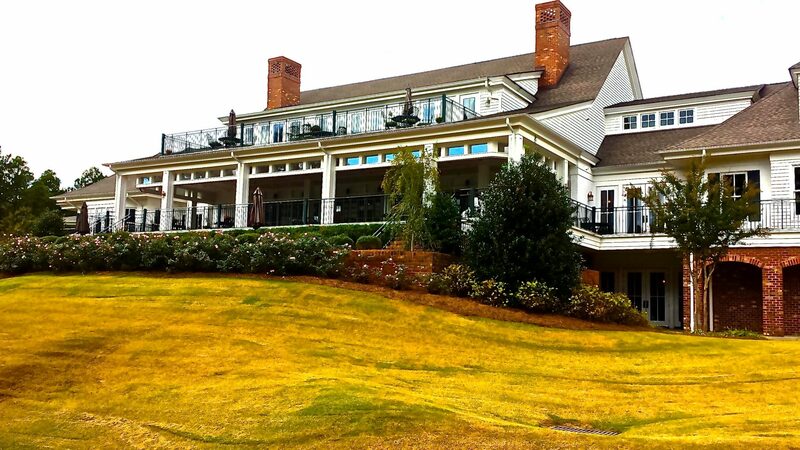 Stay or park at the Carolina Hotel, the ultimate in Pinehurst Resort lodging. The halls are decked with photos, statues, and memorabilia galore. Live music plays on the porch of the Ryder Cup bar after the bagpiper steals the show before sunset, reinforcing the golf theme. 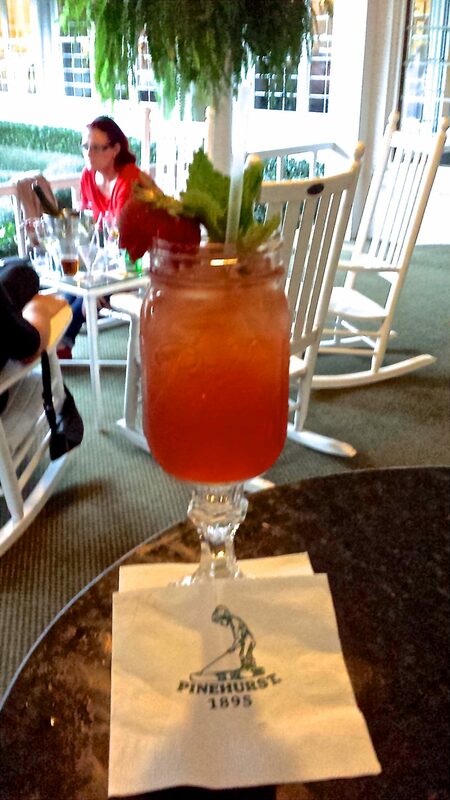 From here, the streets of quintessential Pinehurst can take the lead. Tucked in the piney woods without the asphalt jungle pervading, it is a walk in the park with a hometown atmosphere. Indeed, Olmsted was also the designer of Central Park. On our excursion, the Village Wine shop welcomed us in to a tasting event. Everyone introduced him or her self. They were all happy, funny and talking about golf. It’s a “made it” vibe, which is inclusive, not exclusive. 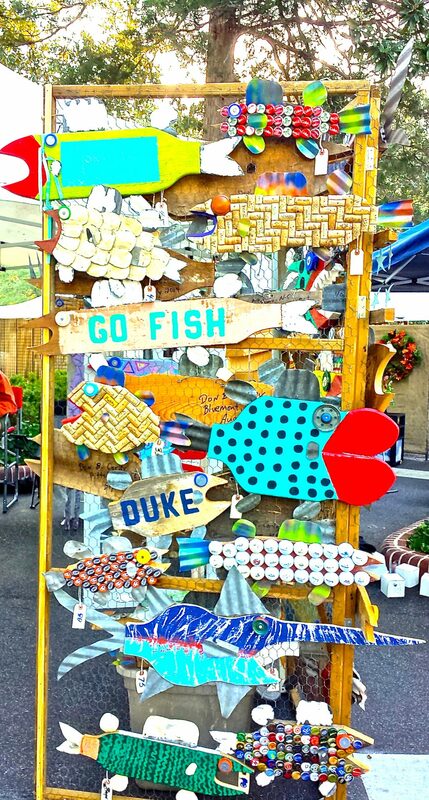 If not golf, then crafts, the gals were excited about the Holly Festival on Saturday when the village streets were loaded with unique vendors. 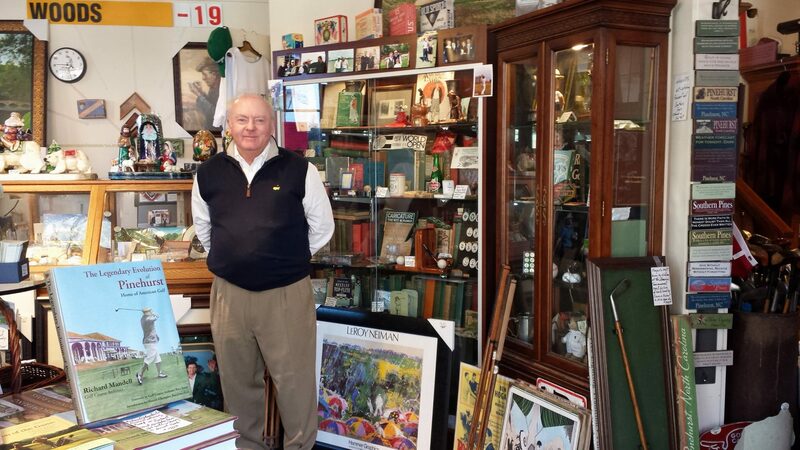 While Alice was selecting ceramic pottery and tapestry golf purses, Danny wandered into the corner golf memorabilia store – Tom Stewart’s Old Sport Gallery. This former PGA player and golf writer toured around the world “to win tournaments, drink beer and chase women” with his buddy. Then he met Ilana, a Russian flight attendant. As they settled down, she needed wall space for her décor and so the store opened for his 40 years of memorabilia to have space. You could spend a day or more browsing the store. 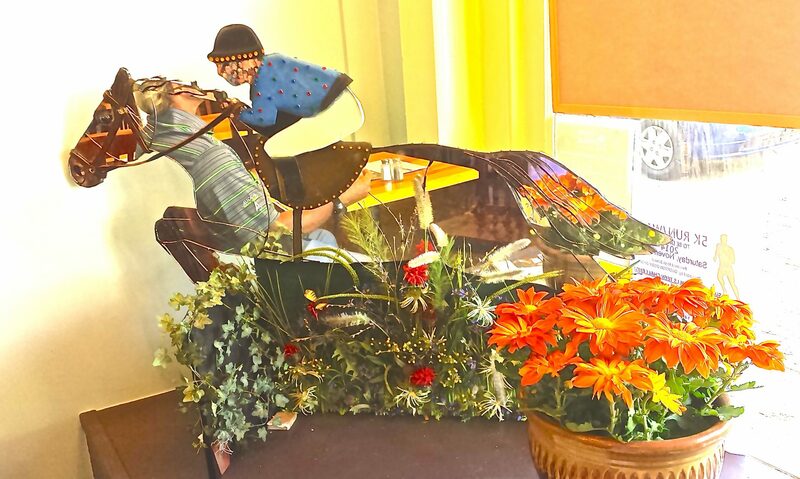 Ilana contributes here too with exquisite hand carved and painted wooden figures from her homeland and scarves and shawls from Turkey. 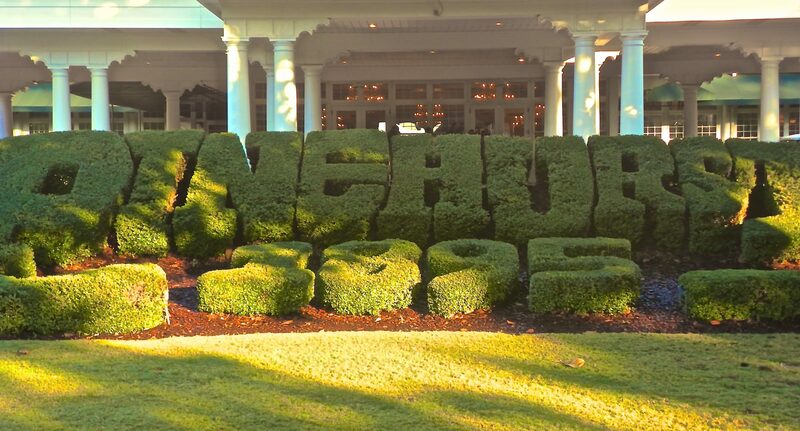 It is a must stop to understand the fabric of Pinehurst. As a car revs up, Tom explains how people with means move here, but let their ego go. He pets a dog named Bailey and chats with his owner, “a Wall Street Cat.” Tom says, “Show off your ex caliber and you’ll have no friends. It is more about the content of character. The handicap is worth more than the resumes.” Inside his shop are tons of books, some he has authored, as well as his sayings on magnetic little boards. We liked the one that defines, “ A golf handicap is a balance between ones pride and his greed.” He wouldn’t let us buy it. He said, “Put it in your pocket. I want you to have it.” It’s hanging on the frig in Arizona, a reminder of how we have bought in to this golf community where you can lay down your trophies and step up to the tee. Dinner options are abundant from fare at the Inns to an Irish pub but we highly recommend the Ironwood Café a mile back in Southern Pines where we met Claire Phillips from the Pinehurst CVB. Vaulted ceilings and luxury appointments inside complement the fountain and gardens outside for an elegant evening. Start with the Asian martini – pear vodka, Domaine Canton and pear juice, light, refreshing and robust all at once. Then don’t pass up the best ever Sea bass. Travel logistics are easy as Raleigh and Fayetteville are within an hour, Charlotte 21/2, attracting a broad-brush population in addition to tourists. The greater Pinehurst area is a destination picked for climate, education, hiking, equestrian and art reasons beyond golf. There is the push pull or boomerang effect making mid 40s the median age. Many experience the area in service at Fort Bragg and return to raise their families, now active in hi tech careers. 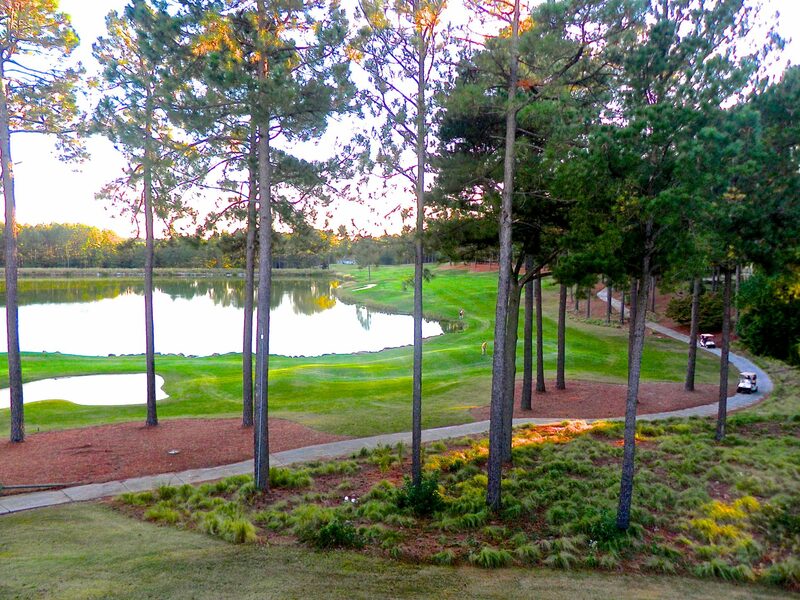 Close to Ft. Bragg, within 40 minutes of Pinehurst is the Bayonet at Puppy Creek golf course. There was no “Rockets’ red glare” but the sound of artillery was bursting in air as we played and the medics who joined our round gave proof of our pride in the military. Bayonet is minutes from downtown Fayetteville, referred to in the past as “Fayettenam” for the roughness around the city. The Bayonett course in contrast is a natural beauty. Golf community homes dot the opening holes that begin with a severe dogleg right over a challenging water carry. Every hole has a unique design through the forest with most of the fairways wide and forgiving lined by streams and ponds. We salute the course as well as our partners and all who put on the uniform. 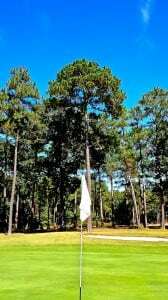 So does Pinehurst Resort offering free play on a designated course on Veteran’s Day to all military personnel.